When we visited my grandparents a couple of months ago, my Granny Anne gave me a vintage cookbook from 1969 called The Year Round Holiday Cookbook, by Suzanne Huntley. It's actually a really interesting cookbook, because it gives you various recipes for all the holidays (even the lesser holidays, like President's Day) and it tells you the history behind the holiday and the food. 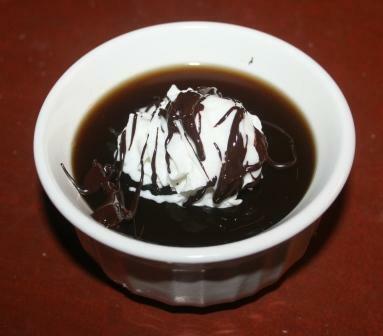 I was flipping through the St. Patrick's Day recipes and found one for Jellied Irish Coffee that seemed intriguing. It's basically an edible version of the drink. Soften the gelatin in 1/2 cup of water. Heat the rest of the water, add the instant coffee and sugar to the softened gelatin. Stir to dissolve the gelatin, add the whiskey, and remove the pan from the fire. Pour into demitasse cups or small bowls and chill until firm. Just before serving, mask the top of the jelly with whipped cream. As the last strains of "My Wild Irish Rose" fade into the night, we can bless Saint Patrick for inspiring this time of "fun and frolic". Erin go bragh! I'm not a big drinker and I only drink wimpy lattes from Starbucks as far as coffee goes, so I added some melted dark chocolate to my Jellied Irish Coffee so that the coffee/whiskey taste would not be so strong. It's kind of like a jello shot. Only with coffee. And whipped cream. I confess not my favorite thing ever, but if you were really into whiskey and coffee, I imagine you'd really love this dessert. I'm sharing this recipe on Joy of Desserts this week. She collects vintage recipes on her blog. I love the idea of drink covered with whip cream. The recipe sounds great -- only whiskey gives me a major head throb, so I'd prolly leave it out. I think that I will have to try this one out! Now I am not sure I would like this - don't drink too much - but turning coffee into jello - interesting. Thank you for participating. Looks like most of your commenters liked it, too. Happy St. Patrick's Day! Looks good! This is a new one for me! If you consider 1969 to be vintage then I guess I am really old! That recipe sounds interesting, but not something I would try...don't say that often of your recipes you post on here.